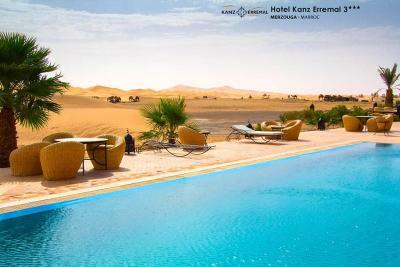 Lock in a great price for Kanz Erremal – rated 8.3 by recent guests! 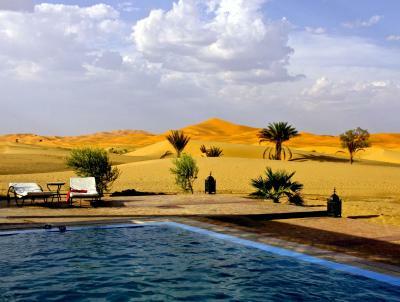 Location, just by the dunes of desert. Very good view from the roof deck! The hotel, at the real opening area of the Desert and with a swimming pool, it boosts up the photographers' ambition to make lots of wonderful photos...and the overnight trip to the deep Desert was well organized: Food, Heat, Music are heartwarming. The Receptionist Souka who replies the emails so diligently with good English and French is absolutely impressive. Beautiful hotel. 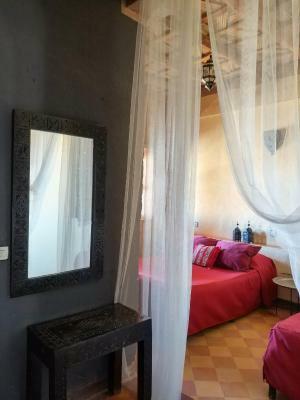 Comfortable facilities. Easy access to camel riding journey to desert. Amazing location and view! Food was also great. Staff is super friendly. 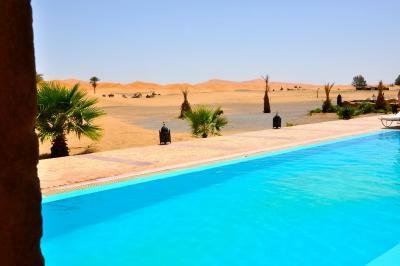 The direct access to the desert, the pool and terrace with an amazing view. 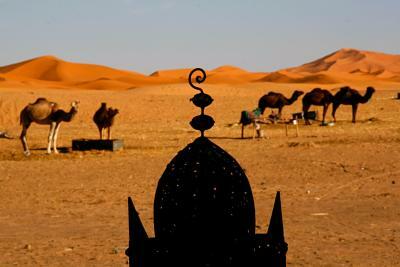 Right on the Sahara. Extremely friendly staff. Beautiful pool though it was too cold the time of year I visited to take advantage of it. 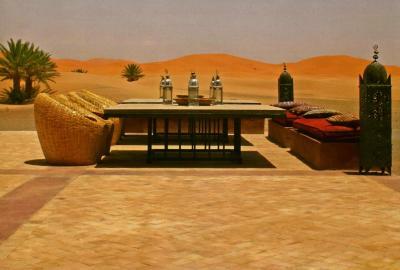 Camel rides are available right at the hotel or you can easily just walk out into the dunes on foot. Well worth the drive out. Very good hotel. 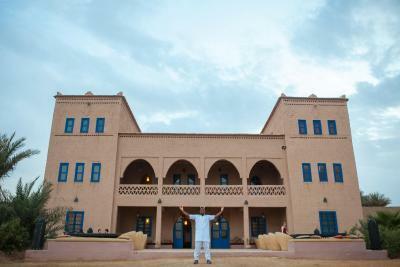 The location was perfect and the staff was very nice. 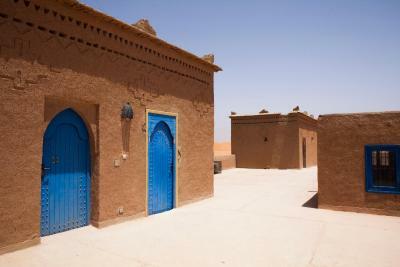 They helped us arrange a new transportation when our bus to ouarzazate was canceled. Thanks especially to Ben Didi! Location is great and the hotel room was very nice. 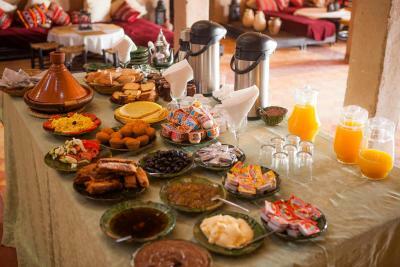 The food was OK.
We stayed at 6 different hotels/riads during our trip in Morocco, and this was by far one of the best. 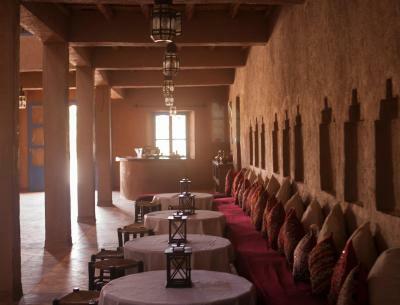 Large and beautifully decorated rooms, friendly and helpful staff who helped us book a camel ride at last-minute notice, excellent location literally right next to the sand dunes. The outdoor swimming pool and live traditional music over dinner were a nice touch. Would definitely recommend. Kanz Erremal This rating is a reflection of how the property compares to the industry standard when it comes to price, facilities and services available. It's based on a self-evaluation by the property. Use this rating to help choose your stay! 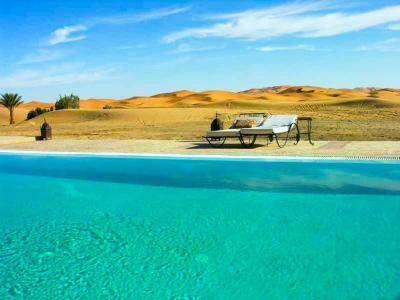 One of our top picks in Merzouga.Kanz Erremal is located in the heart of the desert itself, immersed in the fascinating landscape of the dunes of Erg Chebbi, in the southeast of Morocco. 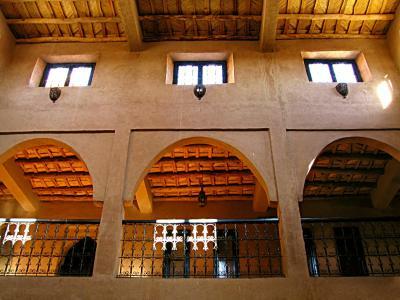 The 14 traditional rooms and suites of the hotel are comfortable and have traditional decoration. 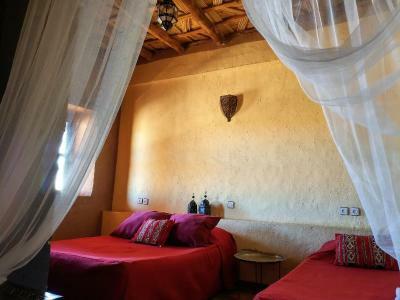 Some rooms have a balcony and all rooms have a view of the dunes of the desert. 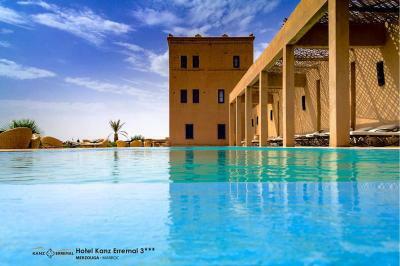 The hotel is located in Tafilalt region, the largest palm field in the country. 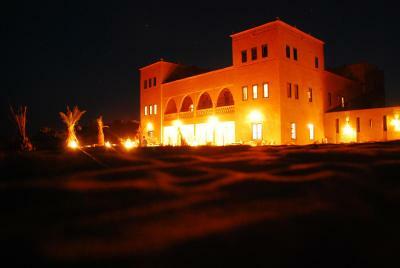 The hotel is located in a privileged spot, at short distance from the dunes with fantastic views. The dunes reach a height of 650 feet. 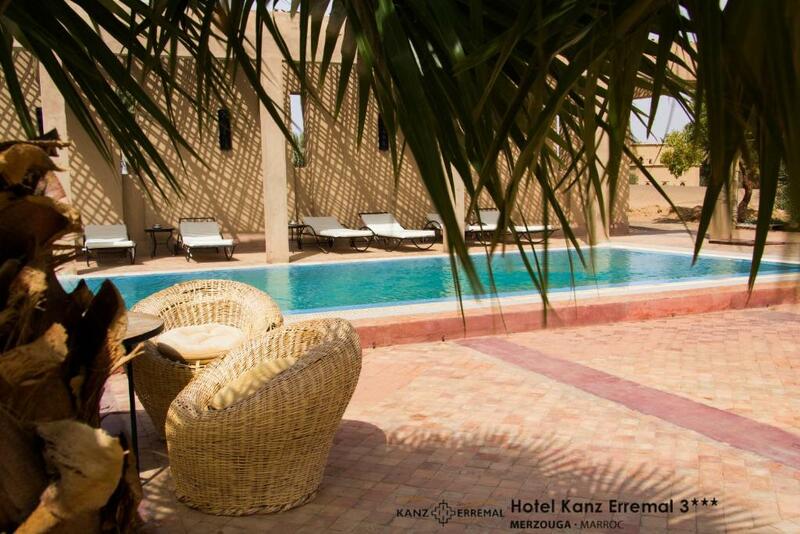 When would you like to stay at Kanz Erremal? House Rules Kanz Erremal takes special requests – add in the next step! Kanz Erremal accepts these cards and reserves the right to temporarily hold an amount prior to arrival. 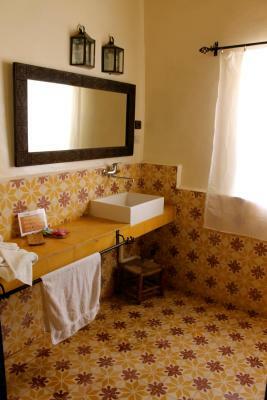 Most rooms face the internal area so it is very noisy. Plus if you get room 3, the balcony faces the staff accommodation so this is noisy till very late in the night. Most staff had very basic English but not enough to explain much to you. The location was fabulous. We recommend getting a room on the very top of the building. It's quiet and with a great view. 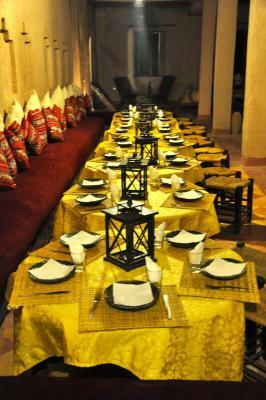 The staff were friendly and the food was plentiful and delicious. 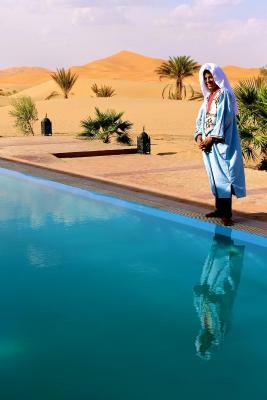 Great places just by the Erg Chebbi dunes, wonderful staff, super helpful and friendly, good food. The staff Thami is a very nice man，everyone are friendly. It would be great if the weather was good. Have been here twice. First time was much better because restaurant served you according to the menu all day long. Last time only for several hours during lunch time and on weekends. For dinner and for week days - only dish of the day. Also the shower didn't work properly - at the end after telling 3 times to the registry it appeared that hot and cold switch were wrongly pointed.... Also the first time i got half-board service, last time only breakfast, which was also worse than before. Big hotel with lots of rooms which might need checking up from time to time, as the shower we used was broken. Soukaina was a great manager. She checked in on us throughout the entire stay and she called to check that we are safe on our journey back to Marrakesh. I highly recommend Kanz Eeremal! Excellent views, affordable prices and incredible customer service! Air conditioner is not function properly, it’s too cold to take a shower in night. good view of sunrise and desert, stuff are really nice. 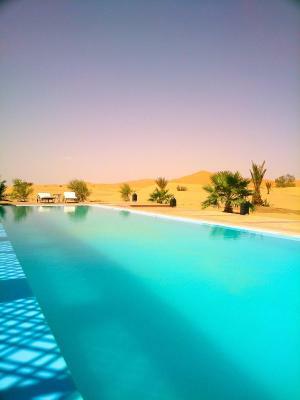 - the whole place was cold (5 degress), breakfast was served in the downstairs meeting area and people were wearing down jackets and beanies and we were still freezing - hotel’s prices for the camel dessert tour (we did sunrise) were waaaay to high. 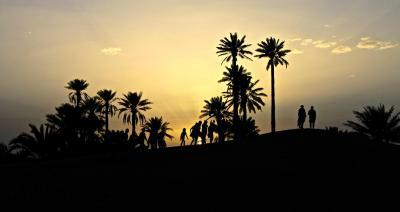 And in the end we had to hike up on the top of the hill on feet, leaving camels behind and then returning. Way overpriced! 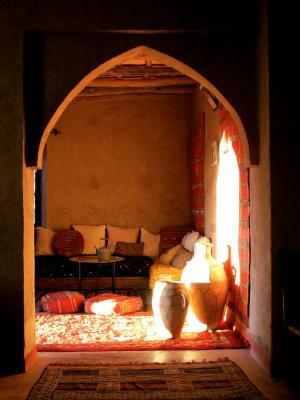 The only place in Morocco i wouldnt want to stay at again. I highly recommend this place. Perfect location, helpful staff, good dinner & breakfast. The Sahara tour, offered by them, exceeded my expectations. The rooms weren’t clean. The bathroom trash was full from previous people staying.